A full-service commercial contractor providing comprehensive construction, construction management, remodeling, furnishing and design services was seeking to refinance its existing debt and support working capital. Due to the challenging nature of the construction business, business mix and historical distributions made to support a related entity, the Company’s liquidity became tight. The Company needed a new lender that understood the business and could provide working capital financing to support its growth. The Company retained Concord as its exclusive financial advisor to arrange its debt financing and identify a Bank that understood the company’s business and objectives. 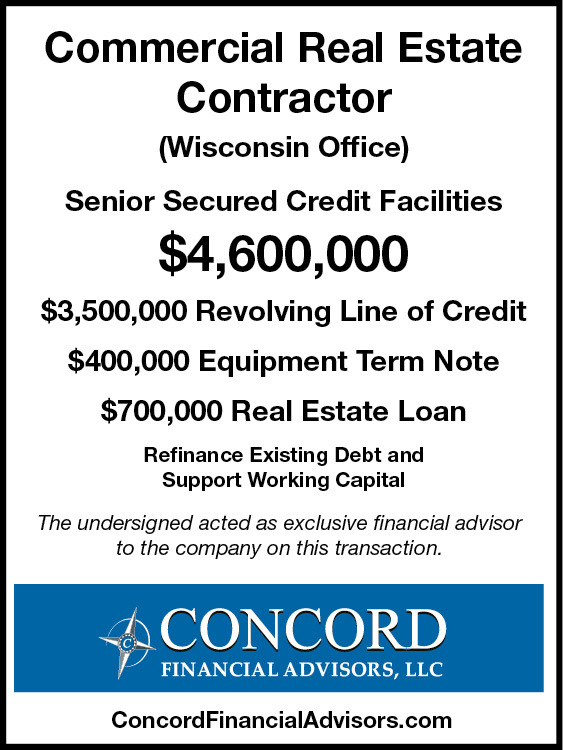 Concord quickly identified the most appropriate senior lenders for the Company and prepared a detailed memorandum highlighting the Company’s strong customer relationships, extensive scope of services, flexibility of delivery, market diversity and experienced management and employees. Concord conducted a targeted and efficient deal process with regional and national asset-based lenders along with several real estate lenders. Concord procured the most appropriate financing for the Company with a local community bank that provided a revolving credit facility, an equipment term loan and two real estate mortgages. The Company’s owner and management team were impressed with Concord’s proven process, the resulting financing structure and the attractive economics of the transaction.